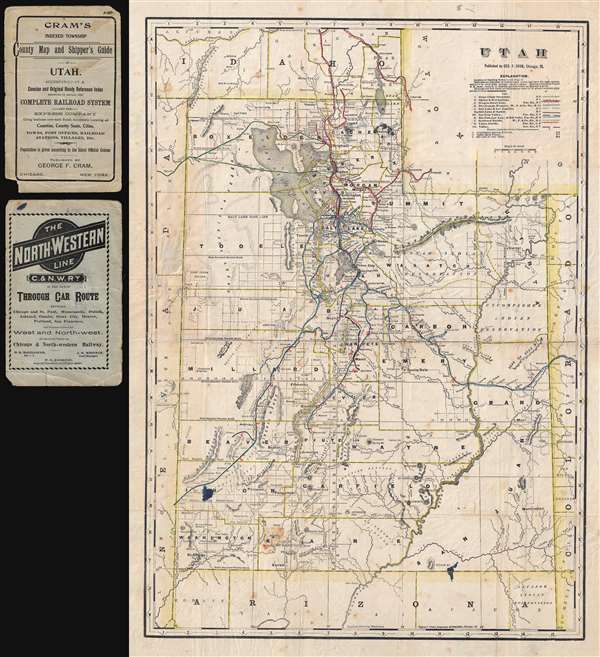 Rare map detailing 11 of Utah's earliest railroads! Utah. / Cram's Indexed Township County Map and Shipper's Guide of Utah. A highly unusual and rare c. 1900 George F. Cram map of Utah illustrating railroad lines. Covering the entire state of Utah, the map is overprinted in red and updated in manuscript, presumably by the publisher, to illustrate 11 railway lines operating throughout the state. Banking towns are circled throughout. It also illustrates mineral deposits, mines, early stage survey work, and topography. Although the map is undated, we can use some of the railroad lines to approximately date it to about 1900, when the San Pedro, Los Angeles and Salt Lake Railroad, was extended south of Milford to at least the Utah border. This map is part of a County Map and Shipper's Guide map series issued by Cram from the late 19th century to about 1920. While maps from this series do come to market from time to time, the present map of Utah is extremely rare. We have been unable to positively identify any comparable examples in the OCLC. Good. Old ink stains - see image. A few minor verso reinforcements. Wear and repairs on original fold lines, especially at fold intersections. Light foxing.